The term “influencer” is a bit of a buzzword in the marketing world at the moment. I’m sure you’ll have heard of influencers before. But do you know exactly what they do, who they are and how influencer marketing can benefit your small business? Today, I’m talking you through everything to do with influencer marketing for small businesses, from the pros and cons to how to get started. Let’s go! An influencer is essentially someone who has an influence on other people’s buying habits. Influencers are usually bloggers, vloggers or people with large social media followings. When they post about a product, their fans and followers are often interested in their recommendation. So much so, that they may go on to purchase the product themselves. Influencer marketing is a bit like the modern version of celebrity endorsements. Twenty years ago, everyone wanted to be wearing what the celebrities were wearing, or using the same shampoo as their favourite movie star. Now, it’s all about the social media influencers. And people often buy products if they have been recommended by their favourite blogger or vlogger. So, how do influencers fit into the marketing world? Many companies, including small businesses, have realised the power influencers hold. People trust their recommendations, so influencers are a great way to advertise your products in an authentic, non-salesy way. Influencer marketing is a collaboration between the brand and the influencer, and it has benefits for both parties. The influencer will receive free goods or payment in return for creating content. And the brand will receive targeted, personalised advertising which will convert into sales and/or more brand awareness. The influencer’s followers are likely to have similar interests and tastes as the influencer themselves. So any recommendations they make are likely to be highly relevant to their followers. Find out more about collaborative marketing and how your small business can benefit from it. Authentic content – influencers will create something unique (whether it’s a beautiful Instagram photo or an in-depth blog post) that appeals to their audience. They know what their followers like, and can come up with creative content that fits their style, increasing the chances of sales conversions. Non-salesy advertising – adverts by influencers look and feel like regular posts. So people who don’t respond well to traditional advertising might be more likely to pay attention. It’s almost like word-of-mouth recommendations from a friend. Trusted sources – as the majority of influencers are real people making real recommendations, and sharing snippets of their real life, their followers feel like they can trust them. Good influencers will only recommend products and brands they truly like and have used themselves. Cost-effective – influencer marketing can be a great way of promoting your small business on a budget. For example, if you’re a restaurant, inviting an influencer to review a three course meal will only set you back the cost of the meal itself. But it could result in 20 bookings from paying customers. Huge reach – just by working with one influencer, you’ll get access to thousands of relevant potential customers. Rather than having to do the hard work yourself and target these people individually, the influencer can instantly put you in front of the right people. No guarantees – just because a popular influencer posts about your product, doesn’t necessarily mean you’ll get lots of sales. Sometimes posts flop, the audience isn’t quite right, or conversions can take months or even years to come through. Complete honesty – influencers are known for being very honest, which is a great thing most of the time. But if an influencer didn’t like your product and posts about the reasons why they wouldn’t recommend it, this can do a huge amount of damage. Brands have limited control over what influencers post, especially if the product was given on a gifting basis, rather than the influencer being paid to promote it. Hard to track – unlike other types of online marketing, influencer marketing for small businesses can be really hard to track. You don’t have access to the influencer’s stats in real time, so you can’t make decisions about how to alter the campaign if something isn’t working. Tracked links to see how many people clicked through from a particular source work really well in blog posts, but on Instagram? Not so much. Can be expensive – influencer marketing can be really cost-effective, but it can also be expensive. Depending on what your product is, it might not be feasible to just give them away for free. For example, if you’re a small tour operator, an all-expenses paid, four-day tour might not work! Some influences are happy to work on a gifting basis. But some (particularly those with very high followings or who do it as a full time job) may require significant payment. If you want to read more about potential pitfalls of influencer marketing for small businesses, Rand Fishkin has written about 10 Problems Plaguing Influencer Marketing. This gives you an overview of potential negatives of the industry as well as ways to overcome these. Now you’ve seen what the benefits can be (as well as some of the potential problems that might crop up), it’s time to start planning your first influencer marketing campaign. For this example, I’m going to pretend your small business is a family-run restaurant in Edinburgh, looking to increase their number of bookings. Step 1: What do you want to get out of this? Before you contact any influencers, have a think about why you want to use influencer marketing for your small business and how it could help. The restaurant, for example, is popular at weekends, but struggles to get bookings during the week. So the aim is to increase weekday trade and encourage locals to visit the restaurant more. There’s no point working with someone who has thousands and thousands of followers if they’re not relevant to your small business. Spend time seeking out lots of different influencers who might suit your small business. Then take a closer look at their profiles: Do they get good engagement on their posts? Do they rank highly on Google? Have they done similar collaborations in the past? For the restaurant, I’d be looking for Edinburgh-based influencers as the majority of their followers are likely to also live in Edinburgh. Ones that have a foodie focus would be great. But don’t discount fashion or lifestyle influencers, if you think their audience would be interested in your restaurant. Before asking influencers if they’d like to get involved, have a brief plan in place so both parties know what’s expected. Will you be paying the influencer or just providing them with free products/a complimentary experience? Are there any time-sensitive restrictions? What do you expect the influencer to post? As the restaurant is looking for weekday bookings, I’d ask the influencer to come in on their choice of weekday to review the weekday set menu. In exchange for posting about the experience on their blog or social media profiles, they’d get a complimentary three course meal for two people. Now it’s time to get in touch with your chosen influencers. Explain what you’re offering and what you’d like them to do. Be polite, friendly and show some interest in the influencer’s work. Perhaps you could explain why you love their content and why you think they’d be a great fit to promote your small business. 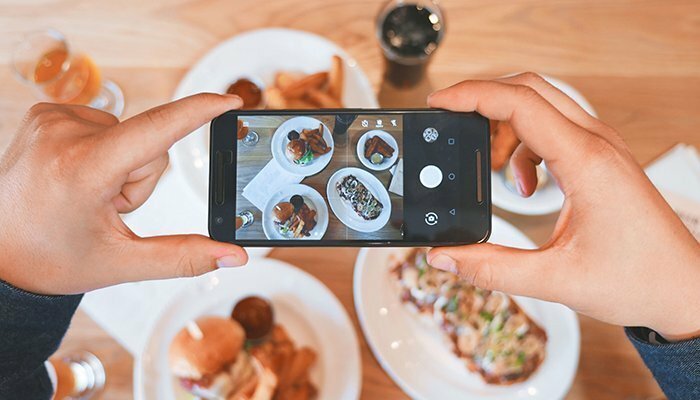 As budgets are often tight with small businesses like our example restaurant, it’s a good idea to start off by working with one or two influencers. Then judge the results and decide if it’s worthwhile expanding the campaign. It’s really important to have a contract in place, especially if money is being exchanged. Make sure you set out how much will be paid (or the value of free goods) and how many blog posts/photos/videos etc. will be expected. Also, add any key messaging that needs to be included and the deadlines for posting. Using the restaurant example, I’d ask influencers to sign a booking form, agreeing to visit the restaurant on X date to receive their complimentary meal. Additionally, I’d ask them to share X number of social media posts on the night. And finally, a blog post review to be posted within two weeks of their visit. Although tracking can sometimes be tricky, do everything you can to make sure you get the best results. If your shop is online, give the influencer a unique, tracked link so you can see how many purchases came directly from their blog post. If they post on Instagram, keep an eye on how many people are engaging with the post. You could even ask to see a screenshot of their stats afterwards. For an experience like a restaurant visit, it can be even harder to track. But why not offer an incentive, such as “quote influencer’s name when booking to receive a complimentary glass of fizz”. This will give you an idea of how many people have booked as a result of this particular influencer marketing campaign.